This is about crossword puzzles and people who do them. Maybe you hate crosswords but do them anyway. 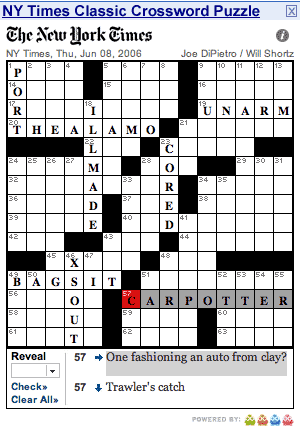 Might be, you don’t even fit the crosswords profile. You’d be lucky. Still, you’d be voluntarily depriving yourself of the vicarious companionship of crossword-fan celebrities like Bill Clinton, Ken Burns and Jon Stewart. Maybe you don’t care for a little adult language. This whole article may not be your cup of tea. Disclaimer: it’s about crosswords, fergawdsakes. Listen, there are actually some good articles on this site, or, you could just change the channel. While we’re waiting for the room to clear, you two folks could move up here to the front row seats, and I won’t have to shout. On September 1, PBS ran “Wordplay”, an “Independent Lens” TV special on crossword addicts – and the New York Times crossword puzzle in particular. We met the legendary Will Shortz, New York Times Crossword Editor, and Merl Reagle, one of the most distinguished of many notable crossword “constructors”. Last I heard, the plural of “holiday” is “holidays”, right? When I saw this in a Human Resources document released this afternoon at work, I at first assumed it was written and published in our local office. But, checking “Properties” for the document, I found it was indeed published by Corporate. It’s my own observation that spelling and grammar have gotten much worst since the internet and e-mail because a misspelling can be propagated by a single individual to the entire group without editorial intervention, and because very often that misspelling is conscientiously imitated by peers like any other new fad. You can see it spread around an office like the flu. One individual misspells the verb “lose” as “loose” (a spell-checker will not catch that), as in “if you do not use all your float days in a year, you will loose them”. Soon, everybody is doing it, and then you start seeing it on the internet forums. Nowadays, with the informality of the internet and e-mail, almost any sloppiness is understood and excused. Never mind that the personal computer has now been with us for over a quarter of a century. If a document is illegible, it may still be perfectly true that the writer simply didn’t give a rat, but the computer gets the blame. Not surprisingly, the individual most likely to initiate a new wave of mis-spelling is already, at least electronically speaking, an authority figure: a manager or executive at work, or the owner of a mailing list. It is not surprising that a manager would have less to fear from propagating a simple spelling mistake (outside the publishing business, that is). The rank-and-file person is more likely to have someone in the know monitoring the mailing lists and cc lines, but in actual practice the authority figure will save the “bigger hammer” for more serious infractions, like my own usage of the vernacular “the shits” above, where “diarrhea” is expected. Ever office have an employee who believe’s that the plural’s of every word deserve’s an apostrophe, and sometime’s any other word ending in ‘s’ (or sounding like it might) deserve’s one too in most of his her’s there sentence’s. One cannot be too careful. I am not going to expand the discussion to cover common internet infractions because most of them are all too obvious. We have seen the last of most of the old-schoolers who typed in ALL CAPS, but now we also have those who make a point of showing how busy they are by typing in all lower case with minimal punctuation. I myself am of mixed emotions on this point. While it’s beyond me to understand why we should get sucked into the trap of becoming everybody’s surrogate fifth-grade grammar cop, it boggles my mind how many people actually expect to be taken seriously when their written presentations of ideas (and even their resumés) look like the contents of a street person’s shopping cart. Mind you, I am not talking about the person or the letter that contains the occasional typo. I’m not even talking about the person who isn’t really a very good speller (and just never will be) and doesn’t spell-check. I’m talking about the person whose compositions are so systematically infested with corruptions of standard English that they are confusing and distracting, difficult to read, and a real challenge to interpret for actual content. We needn’t go back to the old “take a letter Miss Johnson” days where one typo was enough to require re-typing the whole letter — and this, before word processing. There is a very good reason why all of us type our own business and personal letters today: the cost of labor. Miss Johnson, bless her, is retired, reading this article now, and still laughing at all the highly-compensated careers she saved by being a little sharper, and a little more educated in the written word, than her employers. And there’s nobody to replace her, and never again will there be. We’re on our own now. In the long run, I suppose we might revert to pre-ninteenth century English where a word’s spelling and placement in the sentence was determined largly by the whim of the person able to read, write and afford a pen, quill nib, and ink (not to mention the expense of the paper). It might not be so bad. Shakespeare managed quite well – but then you could probably make a case that his influence helped standardize the spellings and usages he employed. Just spare us the few people who need to be excused from school because their self-editing skills are the – well, you know. Q: How in the hell did you spell Machiavellian? A: I was one of those irksome kids who took to spelling naturally. Four years of high school Latin and a voracious reading habit helped. But, no spelling bees. You can still trip me up on the trick words and totally obscure use-me-only-for-spelling-bee words. I’m above average on crossword puzzles but no Expert medals here. Crossword words are not spelling bee words. And the answer is: I just happened to know ‘Machiavelli’.